Nisha Mohammed says she knew something wasn’t right when her 3-year old daughter Katianna was nearing day 5 of fever and illness this summer. “She started to show other debilitating signs that were getting worrisome,” she explains, so she decided to take her to her pediatrician’s office for a check-up. But within moments of assessing Katianna, the family’s pediatrician suspected something much more serious than a fever: Kawasaki disease. Kawasaki disease is a rare illness that usually affects children under the age of 5. It can cause inflammation or swelling of the blood vessels of the heart. The family’s pediatrician urged Nisha to go directly to the Emergency Department at the Montreal Children’s Hospital that same afternoon. Once they arrived at the hospital, it was minutes before Katianna was taken to a private room and given medication to reduce her fever. Nisha and her husband, Minesh, were soon greeted by Dr. Rosie Scuccimarri, a pediatric rheumatologist who confirmed the suspected diagnosis. “That night our lives completely changed,” says Nisha. “We were told Katianna’s treatment would involve an IV-infusion of proteins (called gamma globulin), and that it would be a 12-hour process. We were so scared and in shock.” Just 3 hours into the treatment, in the middle of the night, Katianna began to get weaker, causing a pack of doctors and residents to swarm her room. The treatment had to be halted. Slowly but surely, Katianna’s condition stabilized enough to allow her to resume the gamma globulin 12-hour treatment. Though Minesh and Nisha were apprehensive about what would happen next, they relied on hospital staff and resources to keep them going. “Dr. Scuccimarri and her team visited the room almost hourly giving us updates. The Chaplin prayed with us every step of the way, and would even call for updates, it was beautiful,” says Nisha. Despite signs of progress after her initial treatment, however, signs of Katianna’s Kawasaki illness came back in full force the following morning. A major treatment decision was therefore discussed with the family: Katianna would need additional treatment to interrupt the inflammatory process that could lead to further heart problems. Dr. Scuccimarri and her team recommended a new drug . 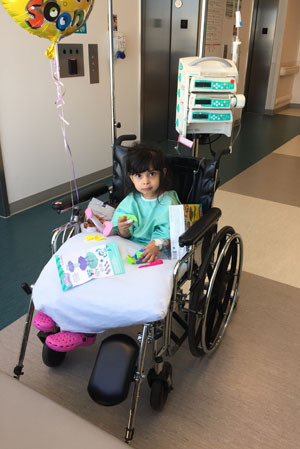 With Katianna’s health stabilized, she was transferred to the 8th floor, where she was reunited with some of the same staff she had encountered earlier in her hospitalization, and with nurses from the PICU still coming by from time to time for updates on how Katianna was doing. It was an experience that Nisha says changed her perspective on what it means to appreciate life. 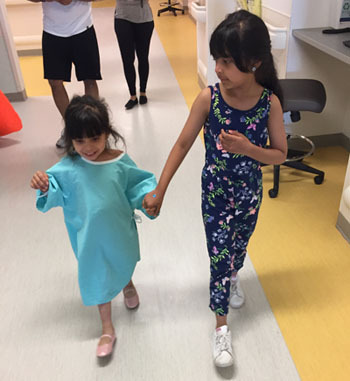 Today, Nisha is happy to report that Katianna is back to being the strong and feisty 3-year old she was before, and remains inseparable from her older sister Khianna. After a number of post-discharge follow-up visits to the hospital, she is doing extremely well and will be followed in one year to keep track of her progress. “The Children's saved my daughter, kept us abreast of the situation and we handled it together. We will always be very grateful,” concludes Nisha.